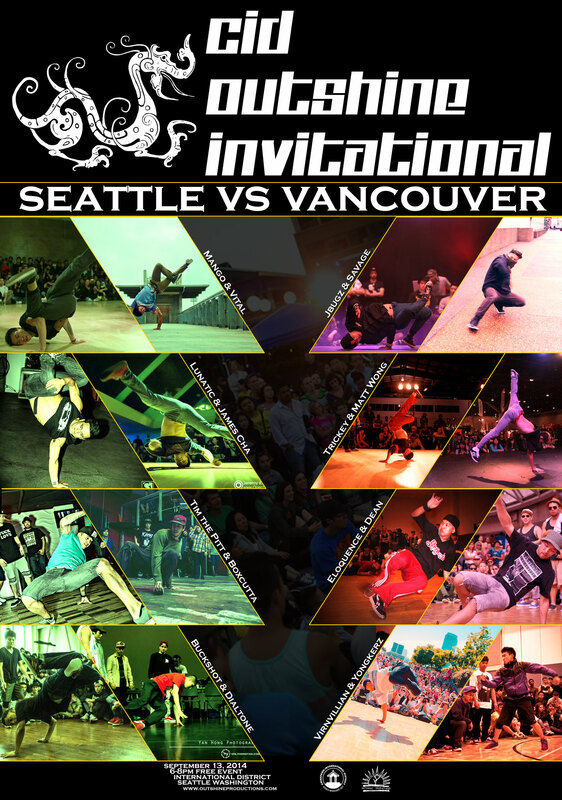 CID Outshine Invitational is our invite only competition featuring the best b-boys from the Northwest. This year we have chosen the 8 best dancers from Seattle and Vancouver to go head to head against each-other in 4 different categories: footwork, power, overall, and crew. Click HERE to go to the event page for more details. This entry was posted in CID Outshine Invitational, Events and tagged aom, b-boy, b-boy boxcutta, b-boy buckshot, b-boy dean, b-boy dialtone, b-boy eloquence, b-boy james cha, b-boy jbugz, b-boy lunatic, b-boy mango, b-boy matt wong, b-boy savage, b-boy tim the pitt, b-boy trickey, b-boy virnvillian, b-boy vital, b-boy yongkerz, battle, break-dancing, cid, cid outshine invitational, dance, event, fraggle rock crew, Massive Monkees, non, outshine productions, seattle by timuomoto. Bookmark the permalink.